Dozens of American diplomats are calling for strikes against the Assad regime, but they offer no endgame. Fifty-one American diplomats issued a “dissent cable” last week to top State Department officials urging a radical change in US policy toward Syria: They want the government to intervene militarily in the civil war and undertake strikes against the brutal regime of Bashar al-Assad. The cable, reported by The New York Times—which posted a draft of the memo online—and The Wall Street Journal and signed by mostly mid-level career Foreign Service officers, urged “a judicious use of stand-off and air weapons, which would undergird and drive a more focused and hard-nosed U.S.-led diplomatic process.” The cable has found support among well-respected figures in the foreign-policy community, and rumors swirl that Secretary of State John Kerry agrees with the general thrust of their dissent. Let’s stipulate a few things about these revelations. First, career Foreign Service officers like those who signed this cable are more often than not the good guys of foreign policy. They hold deep knowledge about the places on which they work and, usually, their policy leanings tilt not toward war but toward, well, diplomacy. 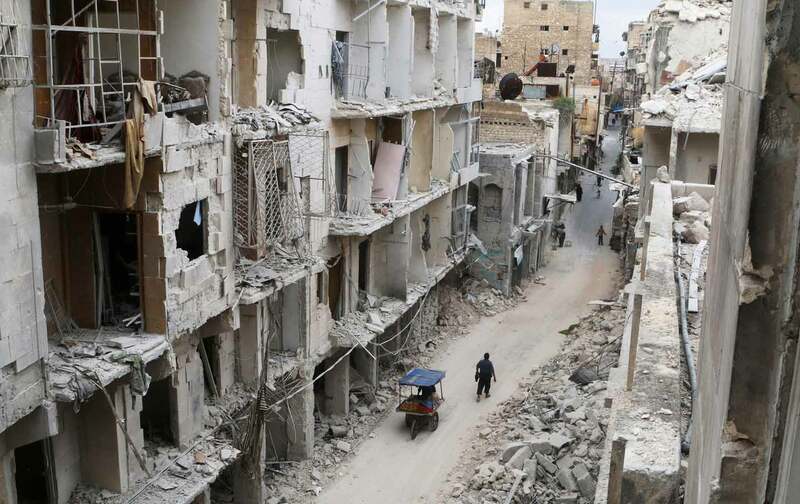 Second, Syria’s multi-faceted civil war is a humanitarian disaster. Hundreds of thousands have perished. The power vacuum created by war has allowed the Islamic State to take over in some regions, where it has imposed a horrific reign of terror over civilians under its control. Lastly, there are no good options for the United States in Syria. The diplomatic dissent is well-intentioned, but it offers little more than leaps in logic. The diplomatic dissent is well intentioned, but it offers little more than leaps in logic. The immediate goal of the memo’s prescriptions is to reestablish the cease-fire put in place in February. Thanks in large part to Assad’s duplicity, it never really took hold. His regime has attacked civilians, including with indiscriminate barrel bombs, and has blocked humanitarian aid. The diplomats who signed the cable are seeking to block these violations of the cease-fire with force. “We believe that achieving our objectives will continue to elude us if we do not include the use of military force as an option to enforce the Cessation of Hostilities (CoH) and compel the Syrian regime to abide by its terms as well as to negotiate a political solution in good faith,” the memo says. Overwhelming US air power could certainly weaken Assad’s offensive capabilities. The bigger problem, though, lies in what comes next. It’s not evident how yet more military strikes in Syria will strengthen a tattered cease-fire. But even if the cease-fire is reestablished, what happens if Assad continues to refuse to engage in a meaningful diplomatic process? On these questions, the memo gives us nothing. It takes as almost a given that the cease-fire alone will lead Assad to rethink his long-held and bloody stubbornness. Mission creep, at that point, seems almost inevitable; a cynic might think it the goal of the memo in the first place. One need only look to Libya to see what happens when the United States enters a conflict with limited aims and no vision of medium- and long-term potential outcomes. The responsibility to protect civilians invoked by the State Department officials was used then as a way to get the US military involved in a NATO coalition war. The aim of the intervention turned quickly from protecting civilians to unseating Muammar Qaddafi. But once the dictator fell, chaos ensued. Despite a warning from Barack Obama that Libya would face instability, little was done to minimize the dangers. At this point, it’s difficult to see the NATO intervention as anything but a strategic failure. Syria offers even less in the way of an organized opposition than did Libya. The web of alliances is sometimes impossible to follow—and always has been. Some commentators have suggested that more robust early American support for rebels would have brought more cohesion. That’s an interesting counterfactual, but it is only that. And there’s certainly no guarantee that protecting rebel forces from Assad today will do anything to unify them. There’s no guarantee that protecting rebel forces from Assad today will do anything to unify them. So what gives? Some reports have suggested the memo’s purpose is to make Syria an issue in the US presidential election. “The internal cable may be an attempt to shape the foreign policy outlook of the next administration,” an official said, as paraphrased in The Wall Street Journal’s report. A Bloomberg article suggested the same thing. Hillary Clinton, both as secretary of state and as a presidential candidate, has been a consistent advocate for more military intervention, whether through more robust arming of rebels or the establishment of a no-fly zone (on the latter, Clinton’s prescriptions have sometimes been incoherent). Clinton, too, however, has failed to address directly the pitfalls of deeper intervention. If deeper involvement in Syria’s civil war takes a sour turn—as, it seems, all US interventions do—what will be her response? Deeper involvement yet? Officials pressing for military conflict with Assad owe it to all of us to answer these questions. “Despite expressing strong anti-Assad sentiments,” a study from the Brookings Institution released last year found, “the bottom line is that Americans remain strongly opposed to American military operations against Assad’s army in Syria, with 72% opposing and 25% supporting such operations.” Those views held across party lines. In a poll released in February, Gallup found that, while a third of Americans want more military involvement, more than half want no escalation of our intervention there. The diplomats should not be scorned for their dissent—it is entirely appropriate that they advise top officials of their thinking—and, though the question of leaking the memo to the general public is more complicated, ultimately our democratic process in deciding whether to intervene is strengthened by having more diverse perspectives. None of that, however, means that the dissenting diplomats, Hillary Clinton, or anyone else advocating a broader US war in Syria should escape the hard questions that our nation so often avoids before military adventures. Syria is too dangerous to make that mistake again.